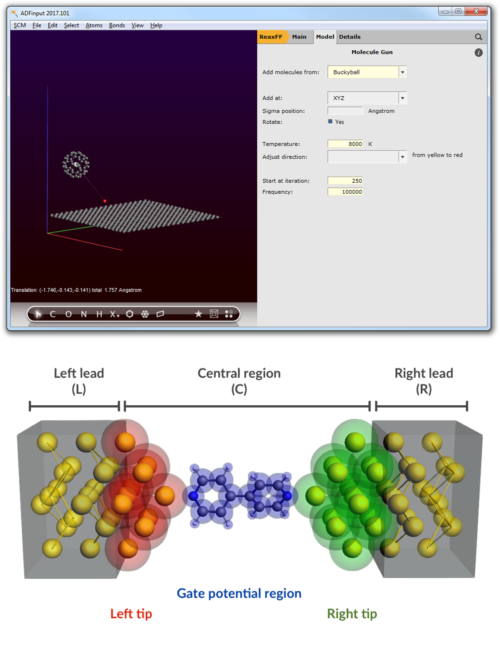 Nanotechnology researchers will find various useful computational tools in the Amsterdam Modeling Suite. Our ADF molecular DFT code is a powerful tool for studying optical properties of nanoparticles, due to efficient and accurate treatment of relativity, making use of symmetry, fast TDDFT methods, and specialized exchange-correlation potentials. Advanced methods are available for environments and multi-level calculations. Surface-enhanced Raman spectra (SERS), as well as hyper-Raman (SEHRS) and optical active (SEROA) spectra of molecules on large metallic nanoparticles are accessible through the DIM/QM methodology. With DFTB and its time-dependent extension TDDFTB, spectroscopic and dynamical properties of very large nanoparticles such as quantum dots are possible, including excited state dynamics and charge transport with non-equilibrium Greens functions (NEGF). ReaxFF has been used widely in nanotechnology. For example carbon nanotube formation, nanoparticle aggregation and Pd nanocatalysts under operating conditions with grand-canonical Monte Carlo (GCMC).